Everyone loves a bit of sunshine! What's not to like? But don't take a risk with your health! 1. Always wear a broad spectrum sunscreen of at least SPF30 at all times, and don't forget your ears and lips. 2. Stay out of direct sunlight between 11am and 4pm. 3. Plan any outdoor activities, such as gardening, walking or playing sport, to avoid the sun when it's at its hottest, usually between 11am and 2pm. 4. If you are prone to sweating, choose a highly water resistant sunscreen like Techniblock. 5. Even on overcast days, dangerous UVA and UVB rays still make their way through the clouds and increase the risk of melanoma. 6. No sunscreen offers 100% protection and you should always wear a hat and sunglasses. 7. Shade offers some protection but you will still get reflective radiation so ensure your skin is protected, even if you are under a parasol or a shady tree. 8. Wear a protective hat at all times. Your forehead, scalp and ears are high risk areas for melanoma, and even more so if you are bald or have thining hair. One of the great things about Techniblock Sunscreen is that it can be sprayed onto the scalp to protect your head. 9. If you are on the water, sailing or boating, ensure you are well protected as water reflects and scatters UV light, making those rays even more intense. 10. Wearing clothes that cover your arms and legs is a good idea but bear in mind that not all colours provide the same amount of protection; wear darker colours as these will stop more of the sun's rays than lighter colours. 11. If you are gardening, put up an umbrella/parasol, sun tent/gazebo or choose a spot in the shade, which will also help you to stay cooler. 12. Full body sun protection is important and certain areas like the neck are especially vulnerable. It can be tricky to reach behind you but with Techniblock, you can spray it easily on your back/neck and it also works upside down too! 13. Protect your eyes with wraparound sunglasses with a good quality UVA blocking filter. 14. 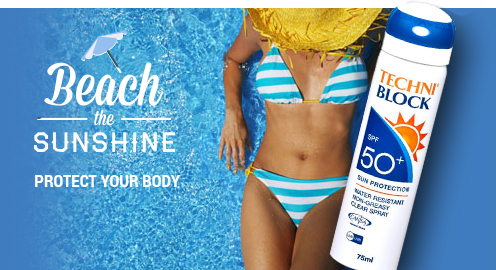 Although Techniblock is a very long lasting sun spray, offering high quality protection for up to 6+ hours, we always recommend that you top up your sunscreen, especially if it is very hot or you are very fair. 15. People with black or Asian skin are still at risk of skin cancer so don't be fooled in to thinking that darker skin types don't need to bother with sunscreen. It's simply not true. 16. Drink plenty of water to stay hydrated. 17. Remember, the sun moves! What was in the shade in the morning will not be a few hours later. 18. Excessive sunbathing is dangerous, not to mention ageing. Keep those age spots and thread veins at bay with a good quality sunscreen like Techniblock Aerosol Sunscreen and Techniblock Anti-Ageing SPF50 Face Protection Cream. 19. If you're a water-babe, try Techniblock SPF50 Wet and Dry, which can be applied on to wet or dry skin. 20. Keep children cool and comfortable with Techniblock SPF50+ for Kids; high protection in a lightweight spray that sand won't stick to.